First years of UTSC! 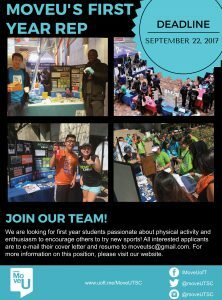 Are you interested in getting involved with MoveU? Then you are in luck: MoveU is looking to recruit volunteer First Year Representatives to join their 2017-2018 team! The deadline to apply is September 22nd, 2017 at 11:59pm. Interested applicants must submit their cover letter and resume via e-mail to moveutsc@gmail.com. Next Next post: How to Exercise on a Bad Mental Health Day!